Like Andrew I wore that quartered shirt in season 62/63. I believe Mr. Wilkinson was still the team trainer and teacher. Others included the keeper Graham Dodsworth, captain and center-half Alan (I think) Moore, John Ashworth, Alan Potts, David Blenkinsop, Glenn Hutchinson (we lived in the same street Radnor Close), Kenneth Collitt, Carl Mudd. Apologies to others whose names I have forgotten. We were not too bad as I recall, winning more than we lost, our worst defeat being a 3-0 loss to Frederick Nattras (or ‘Freddy Nat’ to us) on their home pitch in Bluehall Park, Norton. My best regards to my fellow players and classmates of that year, hope you are all fit, well and thriving wherever your later studies and career took you. Not forgetting John Scott. Kenny Collit sadly as passed away. I think it was Dave Moore not Alan. I still see Dave Moore and Graham Dodsworth kicking about. Is that Tony Reid on your right?? 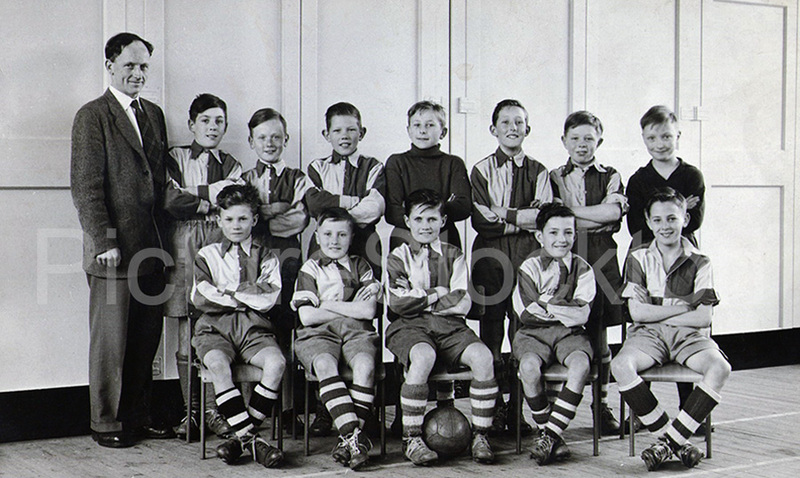 Hi Alan, yes you are correct, it is Tony Reid and I’ve remembered one more, David Bingham who is on the back row, second from the left as we look at the picture. I wore that shirt three years later. Lost 12-1 on my debut away at Newtown Juniors, a much larger school. My last game was away against Roseworth Primary on a Friday afternoon. We went on the bus, just the team, no teachers! Mr. Wilkinson was the sports teacher.